Exploration for the 2012/2013 season has been focused on the “Irish Midlands Orefield” where Unicorn has three licence areas: A. Clonmel B. Gort C. Kilcormick. Unicorn is primarily exploring for Copper, Lead, Zinc and Silver. Ireland is a politically stable country with a well established mining law. The Irish Midlands Orefield is rated as the most successful part of the world for zinc discoveries/ km2 (ref. EMD 2009). “Irish Type” Carbonate Hosted, Zn / Pb deposits are renown for producing “clean” concentrates (i.e. low concentrations of smelter penalty elements such as As, Se or Hg). As such, in an increasingly environmentally sensitive world they are highly sought after and command premium prices. 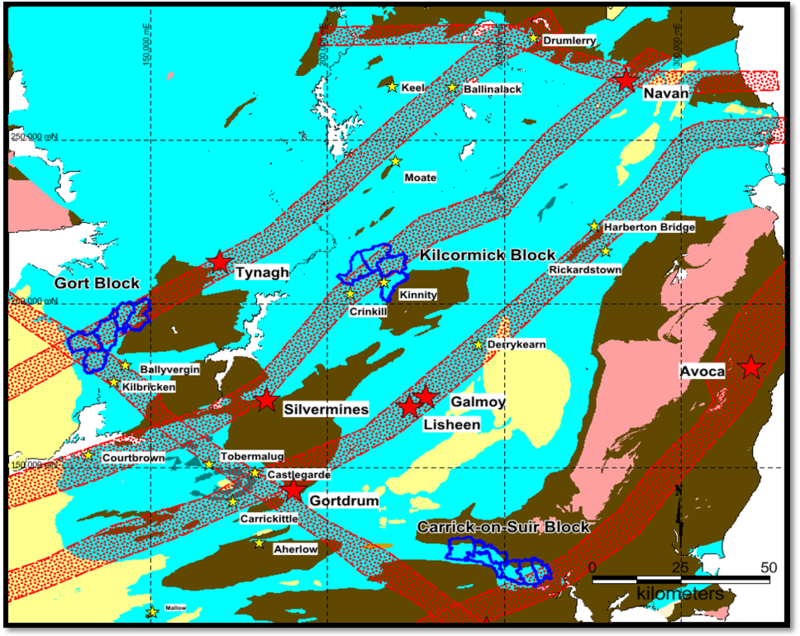 “Irish Type” Carbonate Hosted, Zn / Pb deposits tend to be relatively large and relatively high grade. 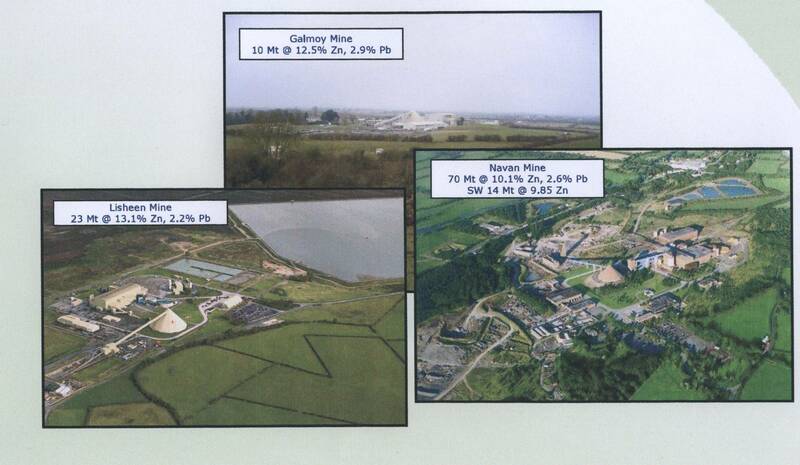 Recent major operating mines in Ireland. Galmoy, Lisheen and Tara. 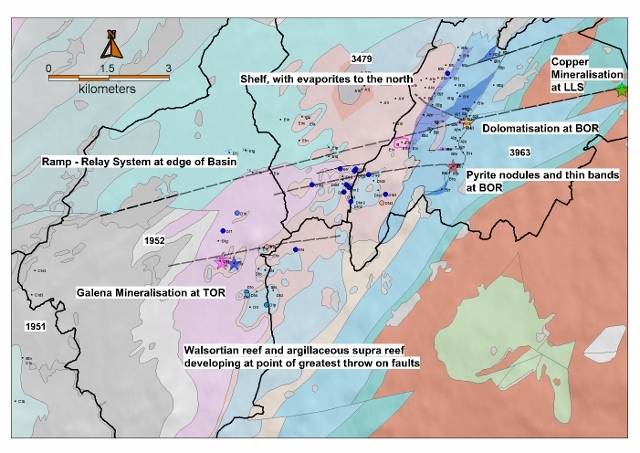 Target – Lisheen / Pallas Green Style basal Waulsortian Reef hosted massive sulphide mineralization. Geology – Extensive sub-cropping Waulsortian Reef, poorly explored. Structure – dominated by a set of NNW striking faults with indirect evidence for E-W and NE-SW striking faults. 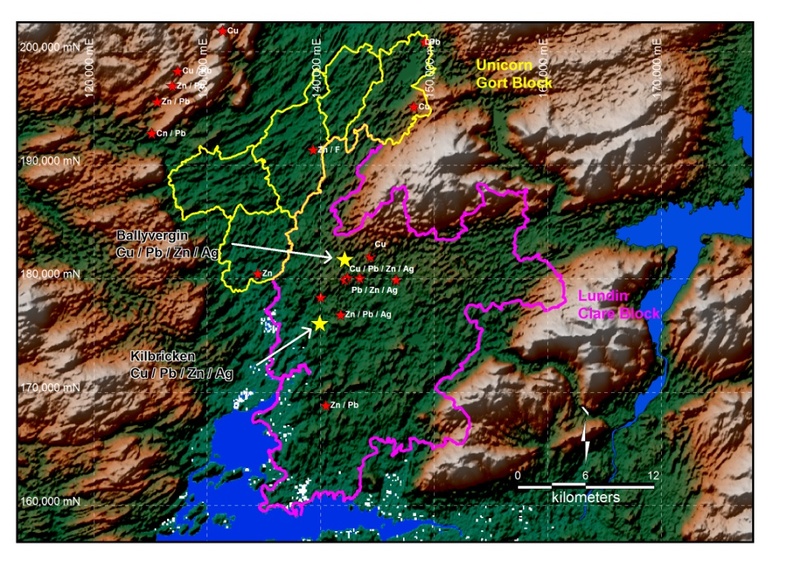 On Licence Areas 3694/3695 Geochemical results show a strong anomaly mainly for zinc. The anomaly is over 30m wide with zinc values frequently reaching 10,000 ppm or more with a maximum of 16,000 ppm. Copper values, also anomalous, are commonly in excess of 100 ppm, with a maximum of 2,280 ppm. Values generally decrease near contact with bedrock to few hundred ppm for zinc. In hole 20 however, they remain high at 4,900 ppm for zinc and 276 ppm for copper. 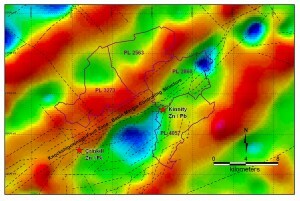 This zinc anomaly is controlled by a NNW trending fault. The fault offsets the ABL against the Waulsortian Reef and is represented by a significant topographic feature. 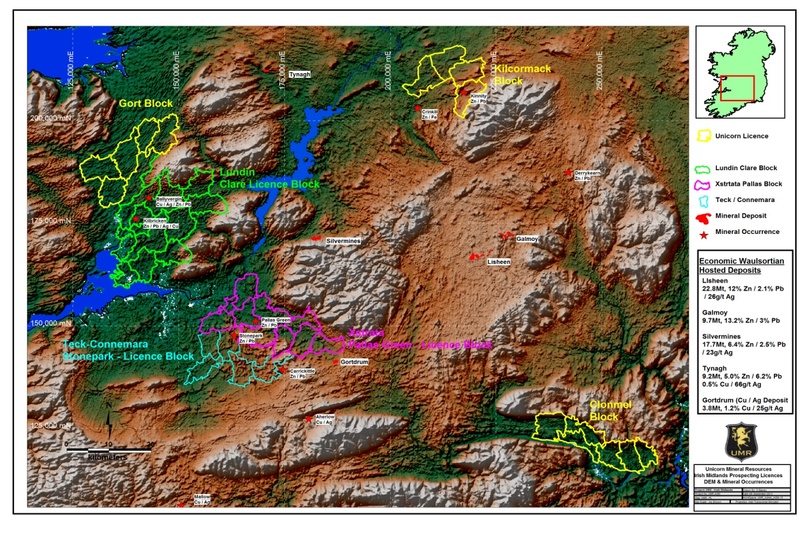 Significant geochemical signatures have also been discovered by soil and deep overburden sampling at Dunkitt on PL 1814. This area is underlain by the Middle ABL Oolite Fm., which is be considered to be a second order target horizon on the block after the Waulsortian Reef. Clear evidence of active faulting controlling local subsidence and basin development. Relatively unexplored – Historical focus in the Irish Midlands Orefield has been the central parts of the basin. Margins were generally considered less prospective, recent successes (Pallas Green, Stone Park, Kilbricken and Lakelands) have disproven this hypothesis. 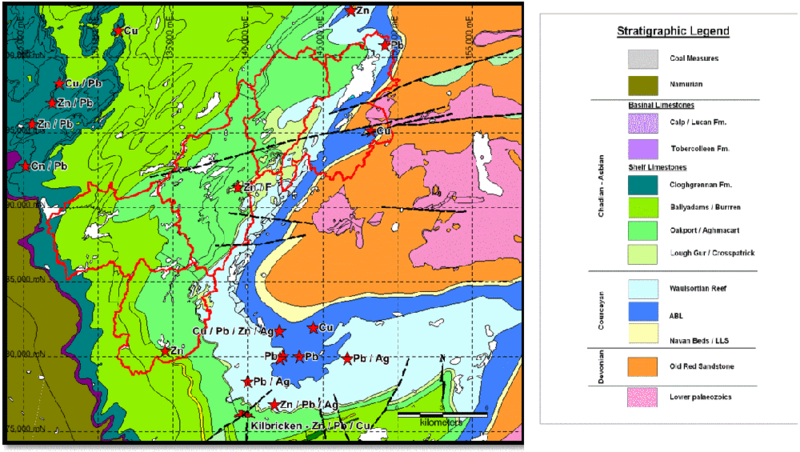 Mineral occurrences of Zn / Pb in the Supra Reef throughout the region and evidence of Cu mineralisation in sub Reef faulting. Unicorn’s geologist and COO Dave Blaney and his team have recently carried out a wide programme of mapping, sampling, geochemical and geophysical exploration on our Gort licence area to identify suitable areas for drilling. Following on from this Dave has developed a new geological model for the area and has narrowed down three areas of interest which we hope to drill over the coming months. Recent drilling has also shown 6.8% copper over a 3 metre intercept in hole 11-3679-153 in what is now known as the “Copper Zone”. The Kinnity Zn / Pb deposit is located on this licence block. High grade breccias hosted massive sulphide mineralisation discovered in the 1990’s by Arcon & Noranda. Clear evidence of large scale active faulting controlling regional subsidence and basin development. Mineral occurrences of Zn / Pb and Massive Pyrite hosted by the Waulsortian Reef. Residual gravity demonstrating the strong NE – SW striking, Caledonian grain running through the block. This feature is part of the basement derived structural architecture that controls the Navan and Silvermines deposits.